Talatal Ghar is located in Rangpur, 4 Km from the present day Sibsagar, Assam, India. It is one of the grandest and it is a marvel of Ahom Architecture. Talatal Ghar is also the largest of all Ahom monuments. After Swargadeo Rudra Singha death, the Palace went through many alteration giving it an irregular shape. Thought there were many alteration done to the structure, the present multi-storied palace, Talatal Ghar, was built by Swargadeo Rajeswar Singha during 1751-1769 A.D. From east to west several rooms consists on a long corridor, and from north to south several smaller wings. The palace is a seven storied structure, four over ground and the rest three underground construction. The ground floor served as stables, store rooms, servants' quarters. 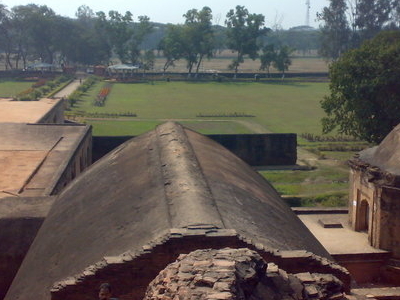 The Royal Apartments were on the upper story, which can not be seen now, other then few rooms which still exists near to an Octagonal room on the northern wing, which was the 'Puja Ghar'. There are stairs which leads to the terrace. An isolated room stand on the south which is believed to have been used by the queen during her confinement. Swargadeo Rajeswar Singha added three underground stories known as Talatal Ghar made of brick and an indigenous type of cement (a mixture of Bora Chaul - a sticky variety of rice grain, eggs of hens etc.) The other four storied Kareng Ghar (or palace) built by Swargadeo Rudra Singha and his successors mainly used woods, which are completely destroyed. The Talatal Ghar had two secret underground tunnels. 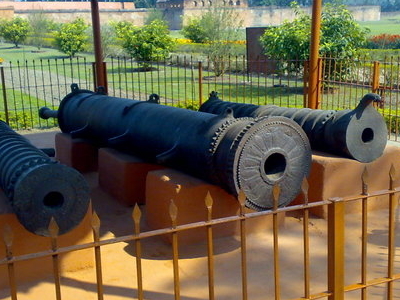 One connected to the Dikhow River which is about 3 Kilometer in length and the other lead to Garhgaon Palace, which is of 16 Kilometer, for use as an escape route in case of any enemy attack. Visitors nowadays can only view the ground floor and first floor and some of remaining portion of the 2nd and 3rd floor of the palace. The underground stories have been sealed and many of the wooden structure of the palace has vanished with time. The palace was surrounded by a brick fortification and also by an earthen fort (Garh) with dikes filled with water. There is a Khar Ghar or gun-powder and ammunition store near the palace. 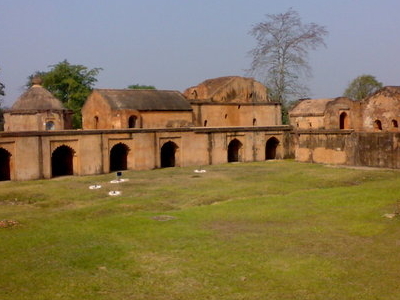 Here's the our members favorite photos of "Forts in Sibsagar". Upload your photo of Talatal Ghar! Hemonta Borah is the only Touristlink member to visit Talatal Ghar. Have you been here? Click here to save it.